Who said cakes have do be made of sugar and spice and crap like that? Behold, meat cakes. As noted on Matome Naver and Sankei News, “meat cakes” (肉ケーキ or “niku keeki”) first started catching on a few years back. Now, they’re appearing more and more at yakiniku (grilled meat) restaurants across the country. See, many Japanese people celebrate birthdays at yakiniku restaurants. 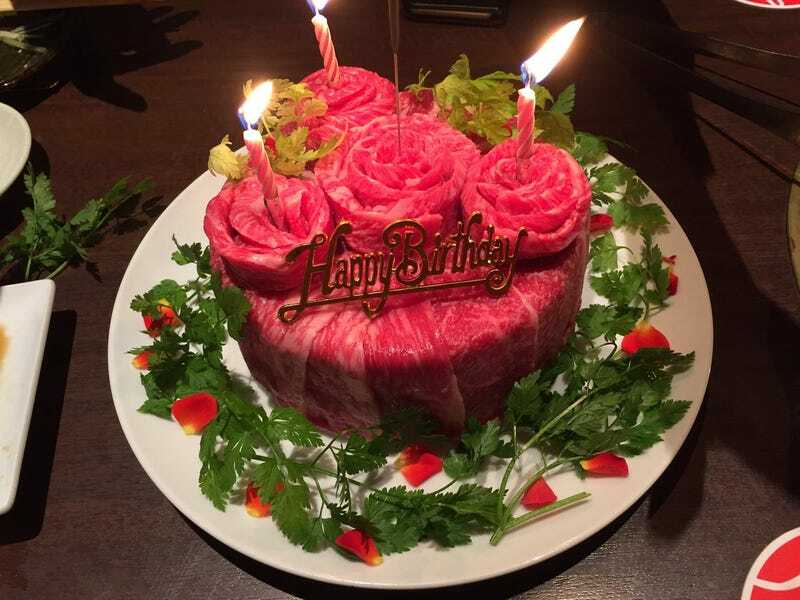 Instead of ordering sweet cakes, some establishments are offering plates of raw beef, pork or chicken arranged to look like cakes. Meat cakes! This is apparently from a Tokyo restaurant’s menu. A restaurant promoting that its meat cakes have been featured on television. Here is another restaurant’s meat cakes on morning TV. Obviously, people grill the meat at their table and don’t eat it raw! Some people are even making them at home, apparently, too. There doesn’t appear to be hard and fast rules in the world of meat cakes. Yet. This article was originally published on November 4, 2015. It has since been updated.